With arrow builds, FOC, or front of center, is an important factor that affects arrow flight and penetration. In this article we are going to take a closer look at arrow FOC and how to use it for our advantage. FOC refers to “front of center”. This is how far the balance point of an arrow is forward of the measured centerpoint. How do we find the FOC of an arrow? Total arrow length. This is the measurement from the grove of nock to the end of the insert. We choose not to include the tip length in order to standardize our arrow builds. Center measurement. This is the total arrow length divided by 2. The measured center of the arrow. Balance point. This is measured from the grove of the nock to the balance point of a fully built arrow. Use these values along with the formula below. Click on the image for a closer look. Now that we understand what FOC actually is, let’s dive deeper into the physics behind FOC and performance. 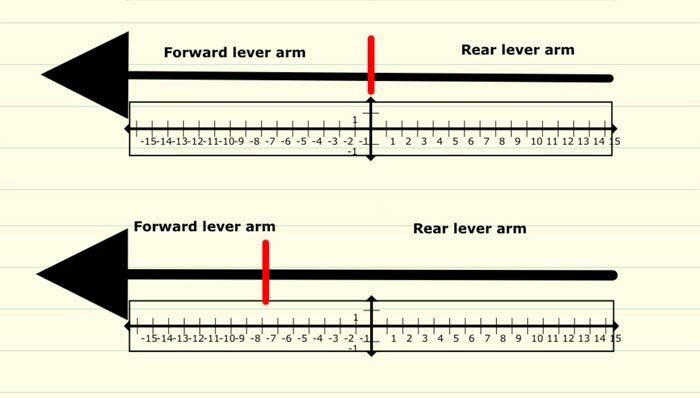 When building arrows we need to look at what is called lever arms. There is a forward lever arm and a rear lever arm, at the balance point. Controlling the length of the lever arm controls amount of flex during the shot and during impact. This is how we end up with a good penetrating arrow with the best dynamic reaction. When setting up your arrow we look at tip weight. The average person shoots a 100 or 125-grain tip, with an average 12% FOC. 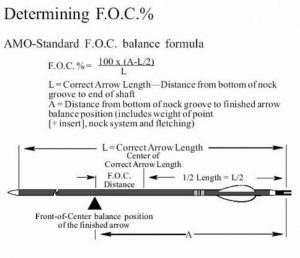 When we look at this arrow what we see in an average of a 28-inch length arrow (carbon to carbon) with a standard insert, we get a total length of 28.34-inches for FOC calculations (end of shaft to end of nock groove). So depending on what nock/vane weight and tip weight you use, your balance point will be around 17.625-inches with center of shaft being 14.17-inches measured from the nock groove. The balance point is 3.46 inches in front of the middle of the total arrow length. 3.4 inches divided by the total arrow length (28.34-inches) gives us 12% FOC. With an increase in arrow FOC, we can see the forward lever arm is getting shorter as the rear lever arm is getting longer. As you continue to increase tip weight, the balance point moves closer to the tip. This increase in arrow FOC shortens the forward lever arm even more, and increases the length of the rear lever arm. 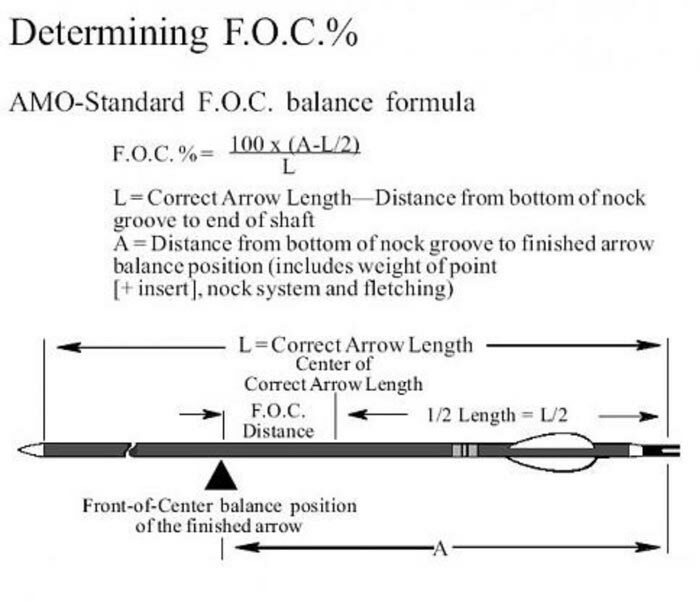 Let’s look at a 19% FOC arrow, and using the same arrow shaft the balance point will now be around the 19.875-inches measured from the nock groove. Looking at the forward lever arm, you can see the forward lever arm is getting shorter, and the rear lever arm is getting longer. Let’s look at penetration. When the arrow hits the intended target, the force is applied to the arrow on the tip end. The target has a resistance to penetration, the point of the arrow has a hard time trying to penetrate the target, and the arrow will flex. This is known as impact flex. By controlling the length of the forward lever arm by going shorter on the forward lever arm, arrow penetration will improve. A shorter forward lever arm is a stronger forward lever arm. Impact flex is something very few people look at or even think about. Impact flex plays a big roe in penetration. Let’s look at impact flex compared to FOC on a 12% arrow. Let’s look at the two figures again. The forward lever arm for the 12% FOC arrow is longer than the forward lever arm for the 19% FOC arrow. You can see how longer forward lever arm for the 12% FOC arrow will have a bigger impact flex than the 19% FOC arrow, which has a shorter forward lever arm. The longer forward lever arm arrow allows for the rear lever arm to have more whip, more oscillation and a slower recovery rate during arrow impact. The longer forward lever arm has more dynamic reaction, during arrow impact. This is not the same as static spine testing, with a 1.94 lb weight pulling sideways on the middle of an arrow, in a spine-testing machine. Dynamic reaction is an impact force applied to the point end of an arrow. Looking at an arrow with a 19% FOC we now have a shorter forward lever arm. The higher FOC, which results in a shorter forward lever arm, will have more momentum than the lower FOC arrow. The higher momentum arrow should have slightly greater penetration, and the rear lever arm will have a less oscillation and a faster recovery. This rear lever arm to have the proper recovery rate also has to be correct dynamic reaction (select appropriate static spine rating for the higher point weight). Just adding tip weight to increase FOC will or can cause penetration problems. This is why when building high/efoc arrows, dynamic reaction arrow tuning plays a big part in building a good hunting arrow. We’ve looked at flex on impact and why higher arrow FOC works. Now let’s look at flex on shot and what we do to make sure we don’t have too much flex (weak arrow reaction) and poor flight. Let’s look at the lever arms again. Looking at the rear lever arm, the length of the rear lever arm affects the amount of flex during the shot. So as we increase FOC, we have to look at the length of the rear lever arm. As the rear lever gets longer, we have a large dynamic reaction. We get more bend. This is the state people call weak arrow reaction or arrow getting weaker. To control this amount of rear lever movement, we control the amount of FOC we adjust the static spine by selecting an appropriate arrow shaft. Since we are looking at building a hunting arrow and getting the best penetration, then we lean towards an arrow with higher FOC. So in order to contend with the rear lever arm length, we can control dynamic spine reaction with appropriate static arrow spine selection. To look at controlling the rear lever arm and to get the best reaction we need to look at tuning methods. We look at dynamic reaction tuning. Doing this type of tuning gets us to the correct static arrow spine rating and the correct rear lever arm length before starting standard forms of tuning. We also need to look at penetration resistance at impact and what role it plays. As the resistance of tissue and bone on impact becomes greater than the resistance of the arrow to bend, then the arrow will bend on impact. This bending will hinder penetration. So, let’s say the penetration resistance at impact (penetration into tissue or bone) is 20 lbs of resistance. 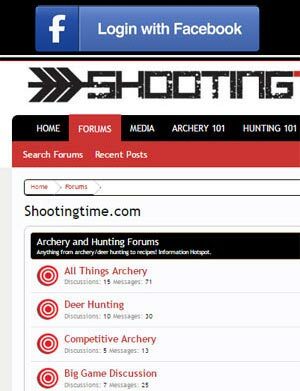 We have two arrows, Arrow A (400 spine and 425 grains total weight) and Arrow B (400 spine and 550 grains total weight). Arrow A and Arrow B do not start to bend, until 25 lbs of impact resistance. Impact flex for both arrows will be at a minimum, because resistance to impact from the arrow will be above the resistance required to cause the arrow to bend/flex at impact. Arrow B will outperform, due to increased momentum from the higher total arrow weight. Arrow C, is also a 400 spine arrow, and also weighs 550 grains but, this arrow only needs 15 lbs of tissue/bone resistance to flex the arrow. 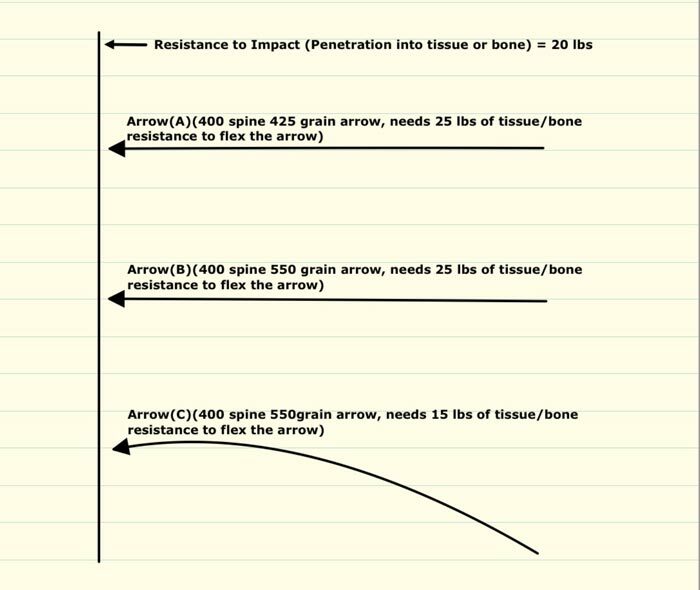 So, this 550 grain arrow, 400 spine arrow, will not outperform Arrow A. Arrow C starts to flex with only 15 lbs of tissue/bone resistance and Arrow A requires 25 lbs of tissue/bone resistance to flex Arrow A. Static spine rating does not tell you about the tissue/bone resistance force, required to make an arrow bend. Total arrow weight does not tell you about the tissue/ bone resistance force, required to make an arrow bend. 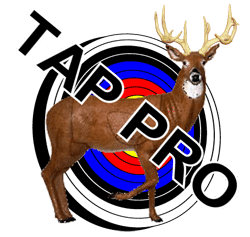 Tissue/bone resistance force pushes on an arrow on the point end, the broadhead end of the arrow shaft.